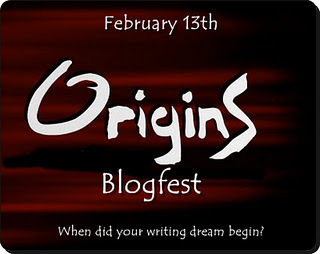 Kristin Creative: The ORIGINS Blogfest! This blogfest is hosted by DL from Cruising Altitude 2.0, Katie Mills from Creepy Query Girl, Alex J. Cavanaugh and Matthew MacNish from The Quintessentially Questionable Query Experiment. I was homeschooled from grades 4-6, and one day a week (or two days a week... or maybe once a month, I don't remember) my "homeschool group" would get together for classes and special activities, organized crafts, competitions, you name it. It was super fun. One of these events, a woman involved in the publishing industry (I don't remember if she was an author, editor or what) came to help us with creative writing. Whatever story I came up with impressed her because after class, she pulled my mom and me aside and gave us some info, encouraging me to consider pursuing writing as a career one day. I thought that was pretty awesome, but I was like, nine or ten and my dad was still working on me to hold my pencil the right way (I still don't... sorry). I had fun with assigned creative writing exercises all through school, but never thought much about writing on my own until a few weeks before college graduation in 2005 when this group of friends started pestering me... in my head. I didn't know who they were or what their names were, but they were trying to tell me their story, so I began to write it down. I got so obsessed with this story, I even brought a notebook with me to my graduation ceremony and kept on writing while they announced everyone's names. But over the next four years, I would work on it, forget about it, work on it, research the publishing industry, get scared and abandon it again, work on it. I finally finished it, got involved in my local Writers Guild and a critique group, started blogging in 2009 in effort to network and learn more about the industry, met some online buddies *waves*, realized my story was crap, shelved it, and began work on some of my other ideas. My current WIP (which I just might finish within the next couple days! EEEEK!) is probably the project I've been the most excited about. I shared it with my mom and grandmother once I had the first two chapters written, and ever since then they've cheered me on and begged for more. Their encouragement (along with that of my critique girls and writing buddies) has really pushed me forward and helped me believe that anything is possible if I put in the work. How wonderful that you have a family that encourages you like that! Good luck with your WIP! that's a perfect quote. And it's awesome you've got a story in the works that has you excited. That's what it's all about. Thanks for sharing your origins! "when this group of friends started pestering me... in my head." How fun! And writing during graduation...I remember pulling some stunts like that when writing my first book...obsessed, I was. Best of luck with the WIP! WTH? I can't believe I wasn't following your blog. Thank goodness for the blogfest that made me double check! Well, since you're so close, you can't quit! you have a positive and innocent spirit! love your beginning! Awww cute baby Kristin! :) I didn't know you were homeschooled. I was too, yo! Love this! I faded in and out of my writing too. Starting my blog really got me to settle down and get serious. It can be scary, but it's so worth it! It's funny how moms can be so important in our origin story. Great post. P.S. Nice to meet a fellow Texan. Wow, exciting that your WIP is almost done! That's something worth celebrating! And love those friends that were pestering you in your head. Nice to meet you via the blogfest. Disney was right! The only way we lose is to quite. Kristen, so happy you are almost done! Many of us seem to take some kind of involuntary break before we go back to writing again. I love how you describe your characters as friends! I always think of my Book as something my characters told me, not something I actually made up! lol. Yay! Exciting! Don't forget to do a "The End" dance when you finish up that WIP! Hey Kristin! I'm a new follower via the Origins blogfest. I love your story. And here I thought I was the only pestered by the friends in my head! It's very exciting to hear that your almost finished with your current WIP. Congrats!! I hope you make it all the way! Excellent! Typing that last punctuation mark should be a hallowed experience. You must feel proud ... kudos! 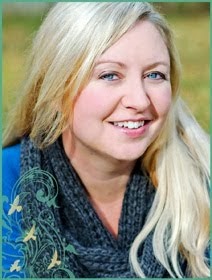 Kristin, I had a scary moment or two when I saw the work involved in publishing. I felt the breath exit my body! I've since recovered and realized, I can do this. Write. Finish. Take another step. No sense worrying over *whether or not I might fail*. Better to concentrate on the writing and how it makes me feel NOW. I can feel the excitement in your words! It's so close you can smell it! Best of luck to you! Cool to *meet* you here in the Fest!